Welcome to Oakland Security Systems Ltd. We have more than 35 years experience in home security services, specialising in Gate Automation and Gate and Railing Design, Intruder Alarms, Access Control and CCTV all delivered in-house. Whether the installation is a small Intruder Alarm System or a much larger project, we can offer a bespoke system to meet your requirements. Our technical department ensures that the equipment we provide is at its most cutting-edge. In addition to Gate Automation, we have our own in-house fabrication team enabling us to fabricate gates and railings to the customers’ individual design. We are proud to be an NSI approved company, the industry’s seal of trust that enables us to deliver security requirements to the highest possible standards. Please contact a member of our team to learn more about our services. 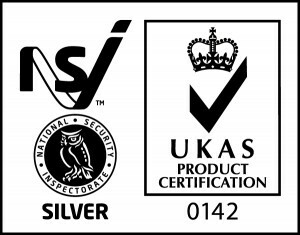 Oakland Security Systems Ltd is proud to be an NSI approved company. The National Security Inspectorate (NSI) is recognised as the leading certification body for the security and fire protection sector in the UK. Businesses and homeowners who choose NSI approved companies, have the reassurance that their chosen contractor will work to the highest industry standards demanded by the Police and Fire Services and the insurance industry. 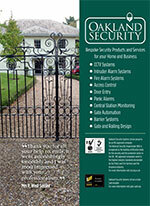 Oakland Security Systems Ltd is accredited members of the Door and Hardware Federation Powered Gate Group. Formed to raise quality and safety standards in the design, manufacture, installation and maintenance of powered gates, member companies within the group are bound by a Code of Practice and work to exacting technical standards, ensuring that every gate supplied, installed or maintained by a DHF member company complies with all current safety legislation and safety standards. In addition, all member companies adhere to the DHF Quality Assured Standards scheme designed to drive up levels of technical competence within the industry. Gate Safe was set up in 2010, in the wake of the tragic deaths of two children crushed by automated gates, in separate accidents. Gate Safe, which has been commended by the Health & Safety Executive (HSE) for its ‘pioneering approach’ was established to improve the understanding of existing legislation and standards, and to offer further guidance in ‘plain english’ to aid the interpretation of what constitutes a safe gate. The charity focuses on raising awareness of the critical safety issues associated with powered gates amongst the wide range of professionals associated with these types of installations, via training and education.